Artist's conception of the super-Earth GJ 1214b, which orbits a red dwarf 40 light-years from the Sun. It was discovered by the MEarth project – an array of small ground-based telescopes. Image: David A. Aguilar, CfA. A super-Earth is a large terrestrial planet with a mass of up to 10 times that of Earth. Super-Earths may be among the most common types of planet in the Galaxy, and some could turn out to be well-suited to life. Around a dozen have been found, but for the most part, astronomers have been unable to pin down their properties because they don't pass in front of, or transit, their central stars as seen from Earth. Transits reveal a planet's size, allowing its density and composition to be inferred. The first transiting super-Earth was discovered by the CoRoT spacecraft in 2009. This planet, called CoRoT-7b, is so close to its central star that one of its hemispheres may be permanently covered in pools of molten lava. 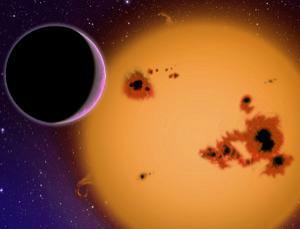 Another super-Earth, also found in 2009, is GJ 1214b. The volume-to-mass ratio of this planet, and its distance from its host star, suggest that a large portion of it may consist of liquid water (see ocean planet). In 2011, astronomers using the HARPS instrument at La Silla Observatory, in Chile, announced, among a batch of 50 new exoplanets, the discovery of a super-Earth in the habitable zone of its central star. HD85512b, which is about 3.6 times as massive as Earth, is in an orbit that suggests its surface temperature ranges from about 30° to 50°C, and that its atmosphere is very humid.